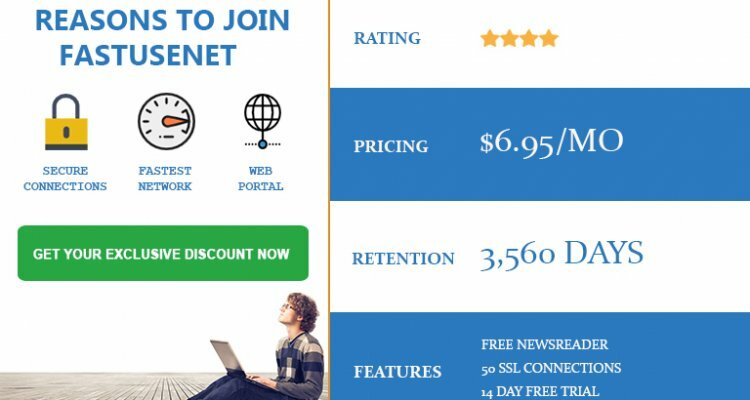 Fast Usenet offers excellent retention, a unrestricted 14 day 15GB free trial and a mobile/web friendly newsreader. 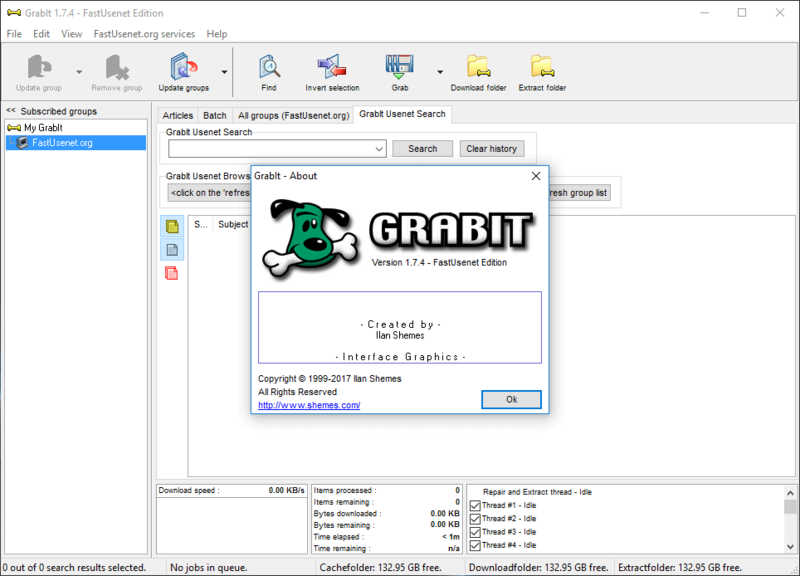 Members also get a free version of GrabIt newsreader. Their custom version of GrabIt has been pre-configured & optimized for their service. It includes built in global search which normally costs $3 a month. Included with your membership. Fast Usenet continues to upgrade their infrastructure and retention time has grown to over 3,500+ days for binaries. Their retention has grown over the last year and doesn't show any sign of stopping. Unlimited Special Offer: For a limited time get Unlimited Usenet access for only $9.95 $6.95. Free Trial: Fast Usenet offers all new customers a 14 day free trial which allows 15GB of access. Unlimited: $9.95 per month with US and EU servers, unlimited downloads and 50 connections. 35 GB: $5.95 per month for 35 GB total downloads each month. 15 GB: $3.95 for a total of 15 GB total downloads per month. 6 GB: $2.95 for 6 GB of downloads per month. Fast Usenet has a generous 14 day free trial. It comes with the newsreader, web and mobile gateways and the search features included. There are no restrictions on their free trial vs the full account memberships. Your download speed is unlimited with this provider. With 50 connections, even those with very fast Internet speeds should be able to top out their download rates. We tested their service with our 150Mbps connection and were able to achieve the maximum download rate with only 20 active connections. With 50 connections the potential is there to achieve even faster speed. Below is a test showing their service with a 650MB connection. 50 secure connections are included on all accounts by default. Fast Usenet has signed SSL certificates so you won't see any errors when connecting with newsreaders that verify the SSL signature before connecting. The GrabIt newsreader with search is a great addition to this service. You'll have access to a search feature, which is a necessity when you are trying to comb through the vast amount of content on Usenet. Normally the search features costs $3/month but with your membership you'll get this feature for free. Fast Usenet offers great retention rates, good pricing and enough options to let even casual users find something that will suit them well. The addition of the web/mobile gateways, and the included newsreader make Fast Usenet one of the better choices for service. Retention rates are some of the highest and their pricing is very good. Not only do you get outstanding retention, competitive pricing but you also get access to their web and mobile interface and a pre-configured version of GrabIt newsreader with global search included. Great features, speeds and service… we highly recommend this provider. 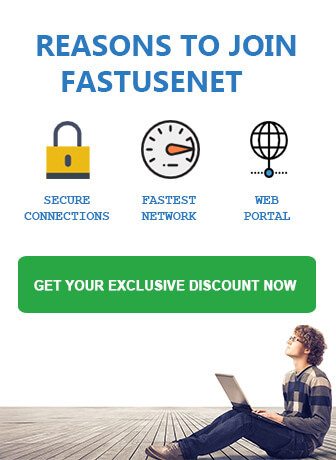 Fast Usenet has recently revamped their website and is offering a limited time special. Get unlimited access for only $6.95/month, which is 30% off the normal price or $9.95. Click on the discount button below to take advantage of this offer.